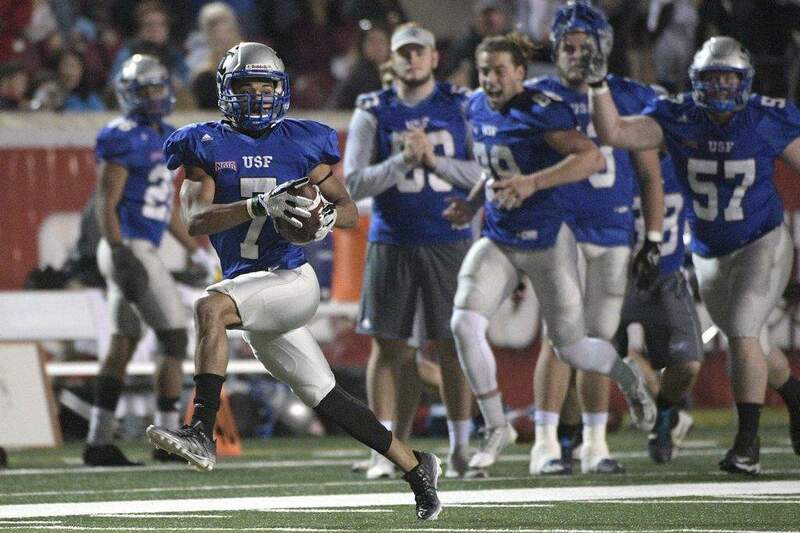 Associated Press St. Francis receiver Dan Ricksy (7) catches a pass for a 34-yard gain during the first half of the NAIA championship NCAA college football game against Reinhardt, Saturday, in Daytona Beach, Fla. The Saint Francis football team won its second straight NAIA national championship with a 24-13 win over Reinhardt (Georgia) on Saturday at Municipal Stadium in Daytona Beach, Florida. The No. 1 Cougars (14-0) won their 23rd straight game, including last year's national title game 38-13 over Baker (Kansas). Saint Francis became the first repeat national champions since Sioux Falls (South Dakota) in 2008 and 2009. The Cougars improved to 2-3 national championship games. The Cougars have beaten the Eagles (12-1) three straight times, including the NAIA quarterfinals in 2015 and the NAIA semifinals in 2016. Saint Francis built up a 24-0 first-half lead (24-7 at halftime) before Reinhardt scored 13 in a row. The Cougars stopped the Eagles on fourth down with four minutes left to help preserve the lead. Justin Green ran for 132 yards and two scores and was named the Player of the Game. Nick Ferrer threw for 270 yards and a touchdown.